Beijing Lhasa Kathmandu tour offers a delightful blend of high adventure and exotic culture. After enjoying full day sightseeing in Beijing, take an overnight train to Xian for one day tour, and then take the flight to Chengdu to Lhasa to explore the mysterious Tibetan culture and its fabulous landscape, lastly to visit Kathmandu. An exploration of the ancient palaces, monasteries and temples, a ride on the world's highest train, a journey to (almost) the top of the world, this tour offers you an experience of a lifetime. This trip takes you on a whirlwind tour to three oriental cities: Beijing, Lhasa and Kathmandu. Exploring these three cities will give you an insight into three ancient cultures, Chinese, Tibetan and Nepalese. After Breakfast Visit Tian'an Men square, which is probably the biggest one of its kind in the world, and the Forbidden City and the Temple of Heaven, in the evening you will visit Peking Opera. After breakfast, excursion to the Badaling Great Wall. After lunch drive to Ming Tombs to visit the Underground Palace of Dingling. Then transfer to rail way station and drive to Xi'an by train, soft sleeper. In the early morning arrival in Xi'an, pick up and transfer to hotel, after refreshment drive to the famous Terracotta Warriors Museum. After lunch, you will visit the Provincial History Museum with its richest collection of artifacts in China. After that you will also visit the Big Wild Goose Pagoda. Tonight, the deluxe Tang Dynasty Dinner Show is reserved for you. In the early morning after breakfast transfer to airport and fly to Tibet, upon arrival at Gonggar Airport, pick up and transfer to Lhasa(3650 m) with about 1 1/2 hours' driving (100km), in the afternoon rest and acclimatize. In the morning visit Potala Palace, which was originally constructed in 637 by Songtsen Gampo, the first king of the united Tibet, and later expanded and served as the winter residence of the Dalai Lamas as well as the religious-political nexus of traditional Tibet. In the afternoon visit Jokhang temple, the center of the Tibetan Buddhism and the sacred land of Buddhist followers where innumerable pilgrims come for worship everyday. The temple, built in 647, is the earliest wood-and-masonry structure still existing in Tibet. Surrounding the Jokhang Temple is the bustling Barkhor Market place which is the religious and social focus of Lhasa. In the morning visit Drepung monastery the sacred land of Gelukpa sect., which was created in 1416 and the second, third and fourth Dalai Lama once resided in. In the afternoon visit Sera monastery, which was created in 1419 and has always been an important Buddhist seminary. As rose are planted everywhere in the monastery, it is also called "the court of wild rose". Today still 200 lamas live in there. 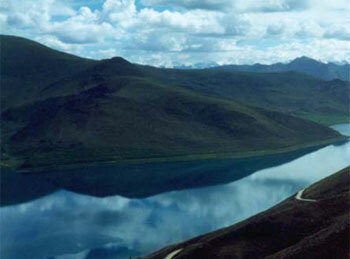 Today is a full day picturesque drive crossing over a colorful Yamdrok Lake. Kambala Pass at 4,794 m and Karola Pass at 5,010m. In Gyantse visit the Kumbum Stupa and Phalkor Monastery. After breakfast drive to Shigatse(3810 m), the second largest town in Tibet and the capital of Tsang, there visit Tashilunpo monastery, the seat of the Panchen Lama built in 1447 and one of the six grand monasteries in Tibet. After breakfast we continue on our drive to Shegar, also called "new Tringri, and crossing over the Gyatsola Pass at 5,220 m, which is the highest en route to Shegar, 240 km. Today we drive to Zhangmu, crossing over Lalung-La (Pass) at 5,050m and Nyalam Pass (3,800 m), with views of beautiful Himalayan Ranges panorama including the Mt. Everest (8,848 m). After breakfast drive to Kodari (Nepal-Tibet border), there you will be picked up by Nepalese guide and then continue on drive to Kathmandu, Capital of Nepal. After Breakfast transfer to Airport for the flight to onward Destination.